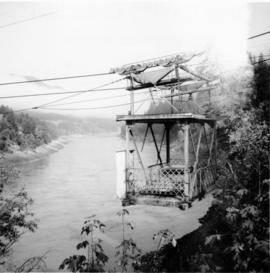 Photograph depicts a free aerial car ferry crossing over the Fraser River. It took 1 car at a time and was in perpetual use at the time Davies crossed. 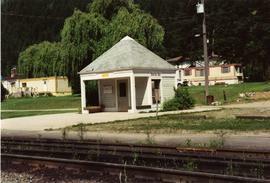 Photograph depicts the Boston Bar CN depot that once was a dismissal point of some importance that had a roundhouse, turntable, etc. 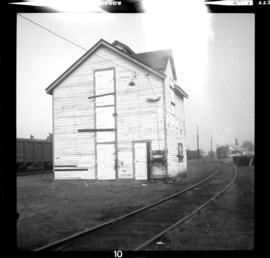 The depot was now empty, awaiting a purchase. 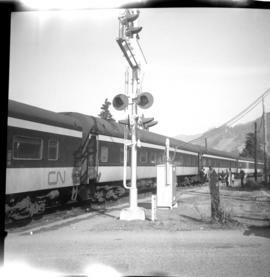 File consists of documentary photographs taken by David Davies of CN in Boston Bar, British Columbia. Photograph depicts CN car #55402, built in 1935. Photograph depicts a locomotive crew change point in Boston Bar. Rocky Mountaineer Rail Tours train visible. 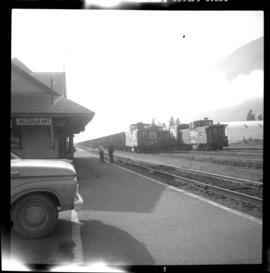 Photograph depicts a locomotive crow change point in Boston Bar. 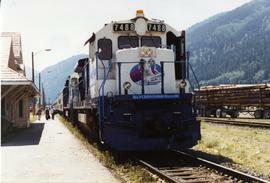 Rocky Mountaineer Rail Tours passing eastbound. 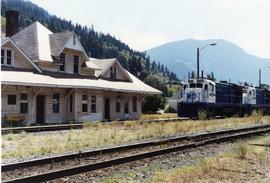 The depot was abandoned and up for sale. 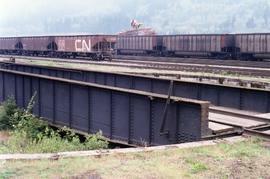 Photograph depicts disused CN track that had been promised to Kamloops Heritage Railway. 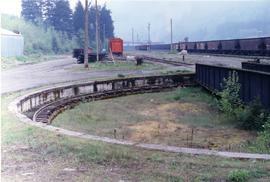 Photograph depicts a CN turntable pit in Boston Bar. 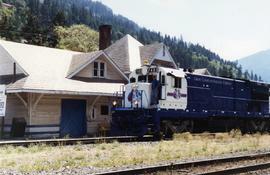 Photograph depicts a westbound train, the Super Continental, standing at the Boston Bar depot. Image captured looking southward. 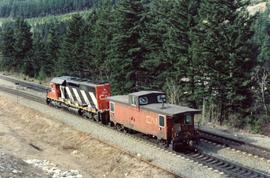 Photograph depicts the three long distance westbound freights being held by the Super Continetal, a westbound train. 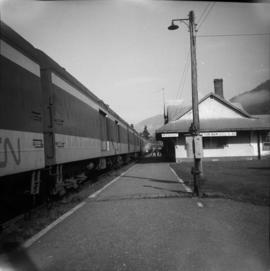 Photograph depicts a westbound train, the Super Continental, standing at the Boston Bar depot. Image captured looking northward. Photograph depicts a former house about 200 yards south of the depot on the eastern side of the main track. 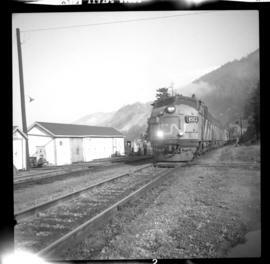 Photograph depicts train #1, the Super Continental, headed westbound, that was just entering the Boston Bar depot. Image captured looking southward. 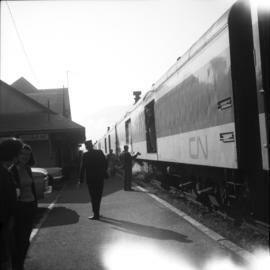 Photograph depicts a passenger train, the Super Continental. The train had stopped for a locomotive crew change. Photograph depicts a fire fighting tender that displays an older CNR insignia. 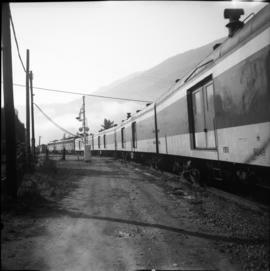 Photograph taken at the Boston Bar depot. Image captured looking towards the north. 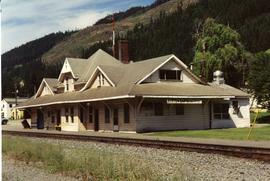 Sign on the depot says "Restaurant" (which was defunct) and "Boston Bar: 2802 miles Montreal, 132 miles Vancouver." 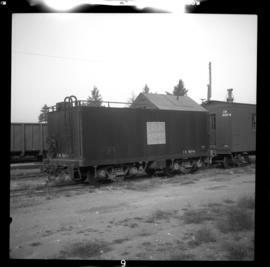 Photograph depicts a CNR caboose, possibly near Boston Bar. 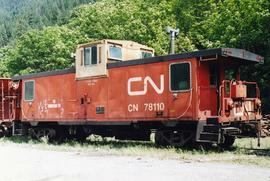 CNR caboose "For Engineering Use"
Photograph depicts a CNR caboose labelled "For Engineering Use." 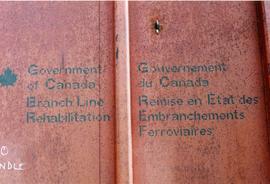 Spotted on a spur behind several ballast cars labelled "Branch Line Rehabilitation." 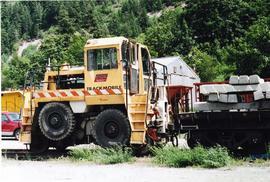 Photograph depicts a CNR tractor, an old piece of Maintenance of Way equipment coverted to haul equipment required to run at low speeds. It also saved switchers. 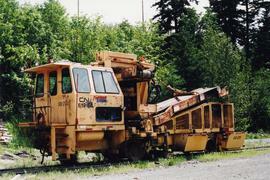 File consists of documentary photographs taken by David Davies of CNR maintenance of way equipment in Boston Bar, British Columbia. 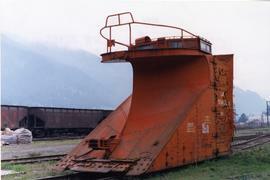 Photograph depicts equipment that says "Fairmont Tamper," but Davies states that it must be a ballast reclaimer and screener. 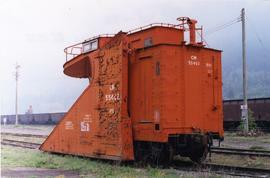 Photograph depicts a "trackmobile" in the CNR Boston Bar yard. Work on replacing ties was being carried out 5-10 miles to north. 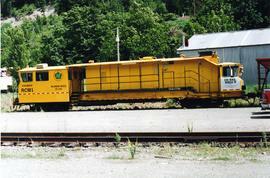 Photograph depicts lettering on several ballast cars which were headed by a tracktor and tailed by a caboose. 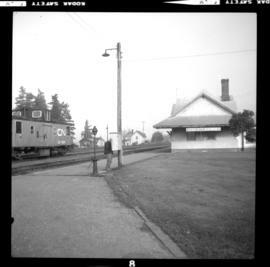 Photograph depicts a shack built by VIA because the depot in Boston bar was unused, empty, locked and awaiting a buyer.